DADAlytics is a new project of the Semantic Lab at Pratt that aims to develop a prototype designed to lower the barriers for institutions who wish to create linked open data from cultural heritage textual materials. Building on our experience developing the Linked Jazz Transcript Analyzer, DADAtics will be a modular, user-friendly tool capable of performing supervised entity extraction from archival documents and generating linked data graphs. With input from key stakeholders, the tool is being designed to accommodate the needs of a wide range of professionals working with various types of cultural heritage materials. The Datalytics Project is made possible through the generous support of IMLS and Pratt Institute School of Information. Linked Jazz is an ongoing project investigating the potential of Linked Open Data technology to enhance the discovery and visibility of digital cultural heritage materials. The project focuses on digital archives of jazz history to expose relationships between musicians and reveal their community’s network. New modes of connecting cultural data and making them searchable as a whole in a seamless discovery environment would open unprecedented opportunities to create new kinds of meaning and elicit new streams of interpretation. The Linked Jazz Project has been generously supported by OCLC, The New Orleans Jazz & Heritage Foundation, The Ella Fitzgerald Charitable Foundation/Jazz Education Network, and Pratt Institute. The Drawings of the Florentine Painters is a linked open data-driven online catalogue that allows users to simultaneously search through all three editions of art historian Bernard Berensen’s seminal work The Drawings of the Florentine Painters. This project was supported by a Digital Resources Grant awarded by the Samuel H. Kress Foundation to Villa I Tatti, The Harvard University Center for Italian Renaissance Studies. The entire dataset is openly available for reuse under a Creative Commons Attribution-ShareAlike license. Working with Primary Investigators, Lukas Klic and Jonathan Nelson of Villa I Tatti, I provided design, methodology and technical advising for the project (full list of contributors). Review of “The Drawings of the Florentine Painters” by Lindsey Gumb. ARLIS/NA Multimedia & Technology Reviews, August 2017. Klic, L., Miller, M., Nelson, J., Pattuelli, M. C. and Provo, A. (2017). The drawings of the Florentine painters: From print catalog to Linked Open Data. The Code4Lib Journal, (38) October 2017. 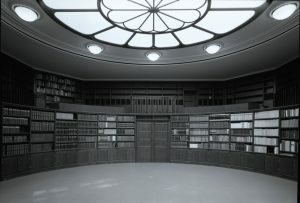 Investigation of the innovations of Aby Warburg’s Kulturwissenschaftliche Bibliothek (Library of Cultural Studies) as a knowledge organization system and method of information access. Supported by the Faculty Development Fund Award, Pratt Institute, 2011. Warburg and his library | Warburg is his library, “Faculty Development Grant” exhibition, The Rubelle and Norman Schafler Gallery, Pratt Institute. June 4 –September 6, 2012. Pattuelli, M. C., Kaufer, E., Shelton, G. & Sitwala, S. (2014). Real-time Reading: A Twitter-based Diary Study of College Students. 6th Annual Qualitative and Quantitative Methods in Libraries (QQML 2014), May 27-30, Istanbul, Turkey. Lopatovska, I., Pattuelli, M. C., Lange, L., and Ludas Orlofsky, V. (2013). E-books in academia: Expectations and challenges. iConference 2013 Proceedings, (pp. 486-490). Lopatovska, I. and Pattuelli, M. C. (2013). Understanding complex phenomena through an educational lens: the case of “fluid reading.” Presented at 5th International Conference on Qualitative and Quantitative Methods in Libraries (QQML 2013), June 4-7, Rome, Italy. Foster, A., O’Connell, F., White, A. and Pattuelli, M.C. (2013). Investigating Reading Preferences of University Students in New York City: A Qualitative Study. Presented at the 5th International Conference on Qualitative and Quantitative Methods in Libraries (QQML 2013), June 4-7, Rome, Italy. Pattuelli, M. C. (2018). From uniform identifiers to graphs, from individuals to communities: What we talk about when we talk about linked person data. 15th International Society for Knowledge Organization (ISKO) Conference, Porto, Portugal, July 9-11, 2018. Pattuelli, M. C. (2016). LAM from the trenches: the LODLAM community and the building of LAM culture, practices, and education: 2015. In Jennifer Arns and Karen Miller (Eds. ), Annual Review of Cultural Heritage Informatics. Lanham, MD: Rowman & Littlefield Publishers. Thorsen, H. K. and Pattuelli, M. C. (2016). Linked Open Data and the cultural heritage landscape. In Ed Jones and Michele Seikel (Eds. ), Supplying Missing Links: Using Linked Data to Expose Cultural Heritage. Chicago, ALA: ALCTS Publishing. Also published by Facet Publishing. Pattuelli, M. C., Provo, A. and Thorson, H. (2015). Ontology building for Linked Open Data: A pragmatic perspective. Journal of Library Metadata, (15)3-4, 265-294.